Published on March 13, 2018 in Daily Dirt and National. Closed Tags: AAA, AARP Public Policy Institute; the Insurance Institute for Highway Safety(IIHS), asphalt, ChORUS (Clearinghouse for Older Road User Safety), construction, construction industry, contractors, highways, Interstate Highway System, Monash University, roads, safety, The Brookings Institution, the Federal Highway Administration (FHWA), the National Highway Traffic Safety Administration (NHTSA), the U.S. Census Bureau, transportation, TRIP. Today’s older Americans enjoy a level of mobility and an active lifestyle that far outpaces previous generations. Demographic trends indicate that the number and proportion of older Americans have increased dramatically in recent years and will continue to do so. The provision of transportation improvements that will make it easier for older American’s to maintain their mobility will benefit users of all ages. And anticipated developments in self-driving and connected vehicles have the potential to provide older Americans with additional mobility options in the future. As the number and proportion of older drivers increases, roadway safety improvements designed to make it easier for older drivers to navigate traffic are becoming increasingly important, as older Americans grapple with the effects of aging while trying to maintain a level of mobility that matches their active lifestyle. This report explores mobility and safety issues for older Americans and presents a set of recommendations for implementing a transportation system that can better serve the safety and mobility needs of older Americans and the population at large. Older Americans form a significant proportion of the overall population and a rapidly increasing number and share of licensed drivers. The number and proportion of older Americans is expected to increase dramatically in the coming years. An estimated 46 million Americans are 65 or older, accounting for 15 percent of the total population. By 2060, the number of Americans ages 65 and older is projected to more than double to over 98 million, and the proportion of the total population over 65 will rise to nearly 24 percent. The number and proportion of licensed drivers 65 or older has surged in the last decade. From 2006 to 2016, the number of licensed drivers 65 or older has increased 38 percent – from 30.1 million in 2006 to 41.7 million in 2016. The proportion of licensed drivers 65 or older has risen from 15 percent in 2006 to 17 percent in 2012 to 19 percent in 2016. The number of all licensed drivers in the U.S. increased by nine percent from 2006 to 2016 from 202.8 million to 221.7 million and the number of licensed drivers less than 65 increased by four percent from 2006 to 2016 from 172.7 million to 180 million. The number of licensed drivers who are 65 or older increased by 16 percent from 2012 to 2016. The number of all licensed drivers increased by five percent from 2012 to 2016 and the number of licensed drivers less than 65 increased by two percent from 2012 to 2016. California, Florida, Texas, New York and Pennsylvania lead the nation in the number of licensed drivers 65 and older. West Virginia, Florida, Maine, Vermont and Arkansas lead the nation in the proportion of licensed drivers who are 65 years or older. Louisiana, Arkansas, South Carolina, Tennessee and Hawaii have seen the greatest increases in the number of licensed drivers in the last five years. 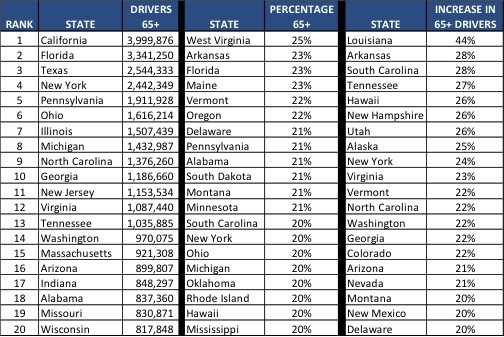 The chart below details the 20 states with the highest number of licensed drivers 65 and older, the highest proportion of licensed drivers 65 and older, and the states with the largest increase in the number of licensed drivers 65 and older from 2012 to 2016. Data for all 50 states can be found in the appendix. The number of older drivers killed or involved in fatal crashes has increased significantly in the last five years, partly due to the increasing number of older drivers and the larger share of drivers who are 65 and older. From 2012 to 2016, there was a 22 percent increase in the number of fatalities in crashes involving at least one driver 65 or older. The number of drivers 65 or older killed in crashes increased 21 percent from 2012 to 2016. Data for all 50 states, as well as a comparison to 2012, can be found in the appendix. The overall number of traffic fatalities in the U.S. increased 11 percent from 2012 to 2016, from 33,782 to 37,461 fatalities. 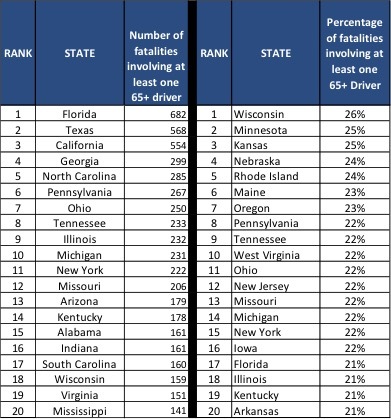 The chart below details the 20 states with the highest number of traffic fatalities in crashes involving at least one driver age 65 or older in 2016, as well as the states with the highest proportion of fatalities in crashes involving at least one driver 65 or older. 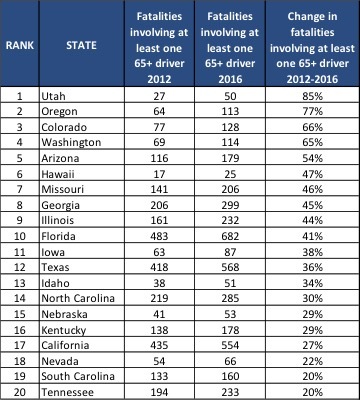 The chart below details the 20 states with the greatest increase between 2012 and 2016 in the number of fatalities in crashes involving at least one driver 65 or older. Nationwide, fatalities in crashes involving at least one driver 65 or older increased 22 percent from 2012 to 2016. 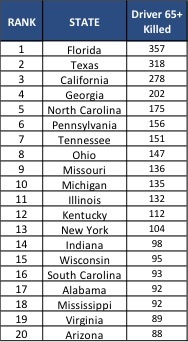 The chart below details the 20 states with the highest number of drivers 65 and older killed in traffic crashes in 2016. Data for all 50 states, as well as a comparison to 2012, can be found in the appendix. Older Americans are more mobile and active than ever and want to maintain that lifestyle for as long as possible. Private vehicles remain the overwhelming transportation mode of choice for older Americans. The level of mobility enjoyed by older Americans is closely tied to their quality of life. For those 65 and older, 90 percent of travel takes place in a private vehicle, and for Americans 85 and older, 80 percent of travel occurs in a private vehicle. The majority of older Americans – 79 percent- tend to live in car-dependent suburban and rural communities, which typically require frequent, longer distance trips by automobile. Because they tend to limit their driving to non-peak hours (typically 9:00 a.m. to 1:00 p.m.), older drivers are disproportionately affected by growing levels of congestion. Their window of opportunity for travel narrows considerably as morning and evening rush hours become longer and midday congestion continues to grow. Many older drivers report self-regulating their driving by traveling only on familiar routes during daylight hours, avoiding left turns and sticking to less complex roads with lower traffic volumes during off-peak travel times. More than 600,000 people aged 70 or older stop driving each year and become dependent on others to meet their transportation needs. Men typically outlive their driving days by seven years and women by ten years. Compared with older drivers, older non-drivers in the U.S. make 15 percent fewer trips to the doctor, 59 percent fewer shopping trips and restaurant trips, and 65 percent fewer trips for social, family and religious activities. Certain situations and driving environments can be especially challenging or hazardous for older motorists. The higher instance of fatalities among older drivers is largely attributable to the physical fragility that makes surviving a crash less likely than younger drivers. Beginning at age 65, the primary danger facing older drivers is their physical fragility, making older drivers much more likely to die when they do crash. Compared to experienced middle-aged drivers, research has found that 60-95 percent of the elevated fatality rates per mile driven for older drivers can be attributed to the fragility that makes surviving a crash more difficult. By comparison, for drivers younger than 20, over-involvement in crashes accounts for more than 95 percent of their excess fatality rates compared with middle-aged drivers. On average, drivers in their mid- to late-eighties have lower crash rates per miles driven than drivers in their early twenties, and roughly half the crash rates of teenagers. In the face of elevated risks, older drivers tend to be very responsible on the road, with a higher rate of seatbelt use than younger drivers, greater avoidance of higher-risk driving environments (such as at night or in rain), and a lower likelihood to drink and drive or be otherwise impaired. As people age, their eyesight, reaction time, cognitive ability and muscle dexterity may deteriorate, often making the tasks associated with driving more difficult. Aging may also limit a body’s range of motion, making it more difficult to scan all directions for nearby vehicles or potential hazards. According to the National Highway Traffic Safety Administration (NHTSA), in 2016, 37 percent of all fatal crashes where at least one driver was aged 65 or older occurred at an intersection or were related to an intersection. However, for fatal crashes where no driver was aged 65 or older, only 20 percent were at an intersection or intersection related. Left-hand turns are more problematic for older drivers, as they must make speed, distance and gap judgments simultaneously to enter or cross the through roadway. Deteriorated vision among older drivers may make small or complex road signage difficult to process. Signs may be misunderstood or not seen quickly enough to caution older drivers about upcoming exits, obstacles or changes in traffic patterns. The amount of light needed by drivers doubles every 13 years, starting at age 20. A 72-year-old needs 16 times the amount of light required by a 20-year-old to drive safely. Older drivers who decide to give up the keys still have options available for maintaining their mobility, though some may come with challenges or drawbacks. Advancements in self-driving and connected vehicle technology may eventually allow older Americans to retain the convenience of private vehicle travel after they are no longer able to drive. While public transit offers an alternative to driving, for older Americans, public transit accounts for just two percent of trips. Older Americans may be reluctant to use transit options because they may have difficulty getting from home to the transit pick-up, or from the transit drop off to their ultimate destination. Crowding, long waits and the physical challenges of boarding a bus may also deter older travelers from using available transit options. A significant proportion of older Americans live in rural areas, where transit options may not be readily available. Seventy percent of Americans over fifty live where transit does not exist or serves the area very poorly. Transit systems can be improved to better accommodate older Americans as well as the population at large. These improvements include expanded bus routes; transit vehicles, stops or facilities that better accommodate older or physically challenged passengers; and, additional non-traditional and private sector approaches to transit, including formal and informal ridesharing and taxi services. Ride-sharing services like Uber or Lyft can help older Americans maintain their mobility if they are no longer driving. 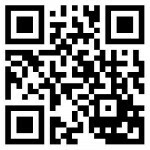 Ridesharing services allow a passenger to use a smartphone app to set a specific pick-up and drop-off point for their trip and summon a private vehicle driven by its owner to complete the trip. However, ride-sharing services often require the use of smartphones, yet less than one -third of Americans over age 65 own a smartphone. Ride-sharing services may not be available or may be limited in rural areas, where many older Americans live. Advances in automotive technology include self-driving vehicles, which do not require the driver to be in control of the vehicle, and connected vehicles, which recognize potential collision situations and allow for crash avoidance through communication between nearby vehicles. Approximately 94 percent of crashes involve human error. Advanced vehicle technology can be of particular assistance to older drivers as it addresses the deficits that may impact motorists as they age. These include identifying vehicles or objects in blind spots, intersection navigation, left turn assist, early warning when vehicles ahead slow or brake suddenly, or warnings when it is not safe to change lanes or pass another vehicle. While these technologies can provide warnings that help drivers avoid a collision, they may also increase distractions behind the wheel. For those who have completely stopped driving, self-driving vehicles may offer the ability to regain their mobility in a private vehicle. However, the timeline for the widespread use of self-driving and connected vehicles is uncertain, and their adoption by older drivers may be slower than that of the general population. In addition to the long timeframe for potential widespread adoption of self-driving vehicles, other uncertainties about the technology still exist, including: the relatively early stage of research and deployment of self-driving technology outside tightly controlled environments, questions about human interactions with the technology, and the potential detriment of overreliance on self-driving technology. While widespread use and adoption of self-driving vehicles may not happen in the near future, many vehicles are already equipped with technological features that are found in self-driving cars. These include adaptive cruise control and headlights; backup and parking assist; blind spot, forward collision and lane departure warning systems; navigation assistance; and integrated Bluetooth capabilities for cell phones. Research by the AAA Foundation for Traffic Safety found that nearly 60 percent of older drivers surveyed had at least one advanced technology in their primary vehicle. The following set of recommendations can improve the mobility and safety of older Americans. These improvements will also improve mobility and safety for all motorists. Clearer, brighter and simpler signage with larger lettering, including overhead indicators for turning lanes and overhead street signs. This should include minimum levels of retroreflectivity. Brighter street lighting, particularly at intersections, and bright, retroreflective pavement markings. Studies also show that increasing the width of pavement markings from 4 inches to 6 inches helps with decreasing lane departure and crashes, especially with older drivers. Where appropriate, widening or adding left-turn lanes and increasing the length of merge or exit lanes. Where appropriate, replacing intersections with roundabouts can eliminate left turns and slow the speed of traffic through an intersection, both of which address common challenges among older drivers. Where appropriate, widening lanes and shoulders to reduce the consequence of driving mistakes. Adding rumble strips to warn motorists when they are leaving the roadway. Making roadway curves more gradual and easier to navigate. Where appropriate, design and operate roads to accommodate all users of the roadway. Adding countdown pedestrian signals and leading pedestrian intervals, which allow for additional time for pedestrians in the intersection before cars get a green light. Adding refuge islands for pedestrians at intersections. 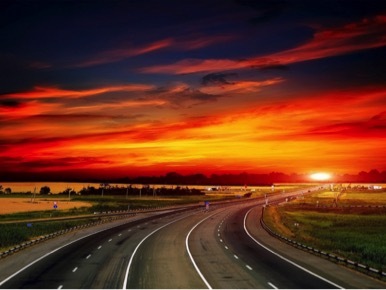 Highway network and transportation system planning, design, maintenance, and operations functions are all likely to require adaptation to meet technical, policy, and legal expectations of a changing vehicle fleet that is technologically connected to other vehicles and the roadway itself. Promotion of education and training programs for older drivers. Raising awareness among older drivers of appropriate safety precautions and seat belt use. Implementing self-driving and connected vehicle technology and the inclusion of additional safety features on new vehicles to address the deficits drivers may face as they age. Improving crashworthiness of vehicles to better protect occupants and withstand impacts. Development of Intelligent Transportation System (ITS) technologies, including crash avoidance technologies. Ensuring public transit vehicles, facilities and stops are easily accessible and accommodating to elderly or disabled passengers. Expanding bus and transit routes. Implementing non-traditional and public sector approaches that are tailored to the needs of older adults, including ridesharing, volunteer driving programs, door-to-door community transportation services, taxi services, and vehicle donation. Older Americans represent an increasing share of the nation’s population and of its licensed drivers. As they strive to maintain the active and fulfilling lifestyles to which they have become accustomed, the nation’s transportation system will need to be improved to accommodate them. Providing transportation improvements that will make it easier for older American’s to maintain their mobility benefits users of all ages. For older Americans, as well as the population in general, the ability to travel represents freedom, activity, and choice. Older Americans prize their mobility and active lifestyles and want to maintain them as long as possible, often by maintaining their ability to drive. Improvements in roadway design, additional highway safety features, expanded transportation options, driver education and the development of self-driving and connected vehicles can help older Americans maintain their mobility in a safe manner while also providing significant benefits to the larger traveling public. All data used in this report is the most current available. Sources of information for this report include: The Federal Highway Administration (FHWA), the National Highway Traffic Safety Administration (NHTSA), ChORUS (Clearinghouse for Older Road User Safety), AAA, The Brookings Institution, Monash University, AARP Public Policy Institute; the Insurance Institute for Highway Safety(IIHS) and the U.S. Census Bureau. TRIP Report: LOUISIANA’S DEFICIENT ROADS COST DRIVERS $6.5 BILLION EACH YEAR – AS MUCH AS $2,466 PER DRIVER. Published on March 31, 2017 in Daily Dirt. Closed Tags: asphalt, bridges, construction, construction industry, contractors, economy, employment, exas Transportation Institute (TTI), Federal Highway Administration (FHWA), Federal Highway Trust Fund, gas tax, heavy equipment, Highway Bill, infrastructure, Interstate Highway System, jobs, Louisiana Department of Transportation and Development (DOTD), National Highway Traffic Safety Administration (NHTSA), pavement, roads, safety, the American Association of State Highway and Transportation Officials (AASHTO), The Bureau of Transportation Statistics (BTS), the Federal Highway Administration (FHWA), the U.S. Census Bureau, transportation, TRIP. 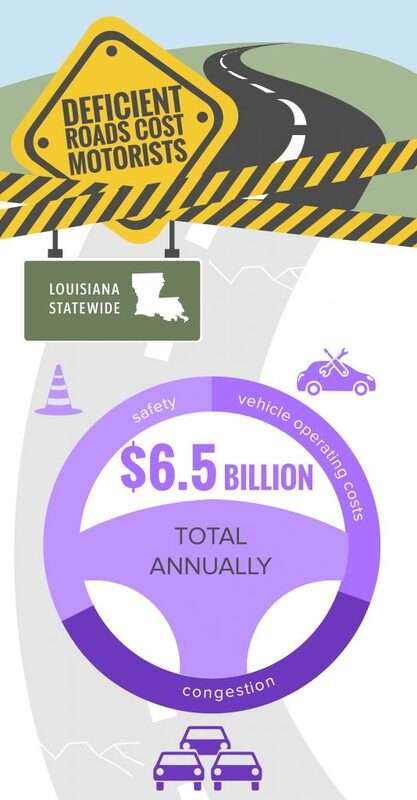 $6.5 billion Driving on deficient roads costs Louisiana motorists a total of $6.5 billion annually in the form of additional vehicle operating costs (VOC), congestion-related delays and traffic crashes. Shreveport: $1,894 TRIP has calculated the cost to the average motorist in Louisiana’s largest urban areas in the form of additional VOC, congestion-related delays and traffic crashes. The average Baton Rouge area driver loses $2,466 annually, while each Lafayette area driver loses $2,024. Each New Orleans area driver loses $2,171 annually and the average Shreveport area driver loses $1,894. 713 On average, 713 people were killed annually in Louisiana traffic crashes from 2011 to 2015, a total of 3,563 fatalities over the five year period. 2X The fatality rate on Louisiana’s non-interstate rural roads is more than double that on all other roads in the state (2.46 fatalities per 100 million vehicle miles of travel vs. 1.16). 38% Shreveport Statewide, 26 percent of Louisiana’s major roads are in poor condition. Thirty-nine percent of major roads in the Baton Rouge urban area are in poor condition and in the Lafayette urban area, 41 percent of major roads are in poor condition. Thirty-nine percent of major roads in the New Orleans urban are in poor condition and 38 percent of major roads in the Shreveport urban area are in poor condition. $734 Billion Annually, $734 billion in goods are shipped to and from sites in Louisiana, relying heavily on the state’s network of roads and bridges. 13% Thirteen percent of the state’s bridges are structurally deficient, meaning there is significant deterioration to the major components of the bridge. Shreveport: 27 hours The average driver in the Baton Rouge urban area loses 47 hours to congestion annually, while each driver in the Lafayette urban area loses 26 hours annually. Drivers in the New Orleans area lose 45 hours to congestion each year, while Shreveport area drivers lose 27 hours annually. Vehicle miles traveled (VMT) in Louisiana increased by 21 percent from 2000 to 2016 –from 40.8 billion VMT in 2000 to 49.5 billion VMT in 2016. Nine years after the nation suffered a significant economic downturn, Louisiana’s economy continues to rebound. The rate of economic growth in Louisiana, which is greatly impacted by the reliability and condition of the state’s transportation system, has a significant impact on quality of life in the Pelican State. With an economy based largely on agriculture, natural resource extraction, manufacturing, and tourism, the quality of Louisiana’s transportation system plays a vital role in the state’s economic growth and quality of life. In this report, TRIP looks at the key transportation numbers in Louisiana as the state addresses its need to modernize and maintain its system of roads, highways, bridges and transit systems. An inadequate transportation system costs Louisiana motorists a total of $6.5 billion every year in the form of additional vehicle operating costs (VOC), congestion-related delays and traffic crashes. Driving on rough roads costs Louisiana motorists a total of $2 billion annually in extra vehicle operating costs. Costs include accelerated vehicle depreciation, additional repair costs, and increased fuel consumption and tire wear. Traffic crashes in which roadway design was likely a contributing factor costs Louisiana motorists a total of $2.1 billion each year in the form of lost household and workplace productivity, insurance and other financial costs. Traffic congestion costs Louisiana motorists a total of $2.4 billion each year in the form of lost time and wasted fuel. TRIP has calculated the average cost to drivers in the state’s largest urban areas as a result of driving on roads that are deteriorated, congested and lack some desirable safety features. The chart below details the costs to drivers in the Baton Rouge, Lafayette, New Orleans and Shreveport urban areas. The rate of population and travel growth in Louisiana have resulted in increased demands on the state’s major roads and highways, leading to increased wear and tear on the state’s transportation system. Louisiana’s population reached approximately 4.7 million residents in 2016, a five percent increase since 2000. Louisiana had 3.4 million licensed drivers in 2015. Vehicle miles traveled (VMT) in Louisiana increased by 21 percent from 2000 to 2016 –from 40.8 billion VMT in 2000 to 49.5 billion VMT in 2015. By 2030, vehicle travel in Louisiana is projected to increase by another 20 percent. From 2000 to 2015, Louisiana’s gross domestic product, a measure of the state’s economic output, increased by 16 percent, when adjusted for inflation. U.S. GDP increased 27 percent during this time. A lack of adequate state and local funding has resulted in nearly a quarter of major roads and highways in Louisiana having pavement surfaces in poor condition, providing a rough ride and costing motorist in the form of additional vehicle operating costs. The pavement data in this report, which is for all arterial and collector roads and highways, is provided by the Federal Highway Administration, based on data submitted annually by the Louisiana Department of Transportation and Development (DOTD) on the condition of major state and locally maintained roads and highways in the state. Statewide, 26 percent of Louisiana’s major locally and state-maintained roads and highways are in poor condition, while 22 percent are in mediocre condition. Fifteen percent of major roads are in fair condition and the remaining 37 percent are in good condition. Thirty-nine percent of Louisiana’s major locally and state-maintained urban roads and highways have pavements in poor condition, while 25 percent are in mediocre condition. Fourteen percent of major roads are in fair condition and the remaining 23 percent are in good condition. Eighteen percent of Louisiana’s major locally and state-maintained rural roads and highways have pavements in poor condition, while 20 percent are in mediocre condition. Sixteen percent of major roads are in fair condition and the remaining 46 percent are in good condition. The chart below details pavement conditions on major urban roads in the Baton Rouge, Lafayette, New Orleans and Shreveport urban areas. Driving on rough roads costs Louisiana motorists a total of $2 billion annually in extra vehicle operating costs. The average driver in the Baton Rouge urban area loses $696 annually, while the average Lafayette urban area driver loses $706 each year as a result of driving on deteriorated roads. Driving on deteriorated roads costs the average New Orleans urban area driver $672 annually, while the average driver in the Shreveport urban area loses $698 annually. Costs include accelerated vehicle depreciation, additional repair costs, and increased fuel consumption and tire wear. Thirteen percent of locally and state-maintained bridges in Louisiana show significant deterioration and are in need of repairs or replacement. This includes all bridges that are 20 feet or more in length. Thirteen percent of Louisiana’s bridges are structurally deficient. A bridge is structurally deficient if there is significant deterioration of the bridge deck, supports or other major components. Structurally deficient bridges are often posted for lower weight or closed to traffic, restricting or redirecting large vehicles, including commercial trucks and emergency services vehicles. The chart below details the number and share of structurally deficient bridges statewide and in the Baton Rouge, Lafayette, New Orleans and Shreveport urban areas. Improving safety features on Louisiana’s roads and highways would likely result in a decrease in the state’s traffic fatalities and serious crashes. It is estimated that roadway features are likely a contributing factor in approximately one-third of all fatal and serious traffic crashes. Between 2011 and 2015 a total of 3,563 people were killed in traffic crashes in Louisiana, an average of 713 fatalities per year. Louisiana’s overall traffic fatality rate of 1.51 fatalities per 100 million vehicle miles of travel in 2015 is the seventh highest in the nation and significantly higher than the national average of 1.13. The fatality rate on Louisiana’s non-interstate rural roads is more than double that on all other roads in the state (2.46 fatalities per 100 million vehicle miles of travel vs. 1.16). The chart below details the average number of fatalities from 2012 to 2014 in the Baton Rouge, Lafayette, New Orleans and Shreveport urban areas and the average cost per driver as a result of traffic crashes. Traffic crashes in Louisiana imposed a total of $6.3 billion in economic costs in 2015. TRIP estimates that traffic crashes in which roadway features were likely a contributing factor imposed $2.1 billion in economic costs in 2015. Increasing levels of traffic congestion cause significant delays in Louisiana, particularly in its larger urban areas, choking commuting and commerce. Traffic congestion robs commuters of time and money and imposes increased costs on businesses, shippers and manufacturers, which are often passed along to the consumer. Based on Texas Transportation Institute (TTI) estimates, the value of lost time and wasted fuel in Louisiana is approximately $2.4 billion per year. The chart below, based on TTI estimates, details the hours lost to congestion annually by the average motorist in each urban area and the cost per driver in lost time and wasted fuel. Investment in Louisiana’s roads, highways and bridges is funded by local, state and federal governments. The current five-year federal surface transportation program includes modest funding increases and provides states with greater funding certainty, but falls far short of providing the level of funding needed to meet the nation’s highway and transit needs. The bill does not include a long-term and sustainable revenue source. The 2015 AASHTO Transportation Bottom Line Report found that if the national rate of vehicle travel increased by 1.4 percent per year, the needed annual investment in the nation’s roads, highways and bridges would need to increase by 64 percent to $144 billion. If vehicle travel grows by 1.6 percent annually the needed annual investment in the nation’s roads, highways and bridges 2015 AASHTO Transportation Bottom Line Report would need to increase by 77 percent to $156 billion. The efficiency of Louisiana’s transportation system, particularly its highways, is critical to the health of the state’s economy. Businesses rely on an efficient and dependable transportation system to move products and services. A key component in business efficiency and success is the level and ease of access to customers, markets, materials and workers. Annually, $734 billion in goods are shipped to and from sites in Louisiana, relying heavily on the state’s network of roads and bridges. Sources of information for this report include the Louisiana Department of Transportation and Development (DOTD), the Federal Highway Administration (FHWA), the American Association of State Highway and Transportation Officials (AASHTO), the Bureau of Transportation Statistics (BTS), the U.S. Census Bureau, the Texas Transportation Institute (TTI) and the National Highway Traffic Safety Administration (NHTSA). Published on June 26, 2016 in Constructioneer, Daily Dirt and National. Closed Tags: asphalt, bridges, concrete, construction, construction industry, contractors, economy, equipment, Federal Highway Administration (FHWA), Federal Highway Trust Fund, gas tax, Highway Bill, highways, infrastructure, Interstate Highway System, jobs, National Highway Traffic Safety Administration (NHTSA), New Jersey Department of Transportation (NJDOT), pavement, roads, safety, the American Association of State Highway and Transportation Officials (AASHTO), The Bureau of Transportation Statistics (BTS), the Federal Highway Administration (FHWA), the Texas Transportation Institute (TTI), the U.S. Census Bureau, transportation, TRIP. Roads and bridges that are deficient, congested or lack desirable safety features cost New Jersey motorists a total of $13.1 billion statewide annually – more than $2,600 per driver – due to higher vehicle operating costs, traffic crashes and congestion-related delays. Increased investment in transportation improvements at the local, state and federal levels could relieve traffic congestion, improve road, bridge and transit conditions, boost safety, and support long-term economic growth in New Jersey, according to a new report released today by TRIP, a Washington, DC based national transportation organization. The TRIP report, “New Jersey Transportation by the Numbers: Meeting the State’s Need for Safe, Smooth and Efficient Mobility,” finds that more than one-third of the state’s major roads are in poor condition and more than one-third of New Jersey’s bridges are structurally deficient or functionally obsolete. The state’s major urban roads are becoming increasingly congested, with drivers facing some of the longest commutes in the nation. And an average of 574 people were killed annually in crashes on New Jersey’s roads from 2010 to 2014. Driving on deficient roads costs each New Jersey driver $2,626 per year – a total of $13.1 billion statewide- in the form of extra vehicle operating costs (VOC) as a result of driving on roads in need of repair, lost time and fuel due to congestion-related delays, and the costs of traffic crashes in which roadway features likely were a contributing factor. A breakdown of the costs per motorist along with a statewide total is below. The TRIP report finds that 37 percent of major locally and state-maintained roads in New Jersey are in poor condition and another 41 percent are in mediocre and fair condition. The remaining 22 percent are in good condition. Driving on deteriorated roads costs the average New Jersey motorist an additional $632 each year in extra vehicle operating costs, including accelerated vehicle depreciation, additional repair costs, and increased fuel consumption and tire wear. 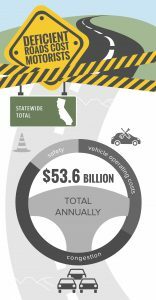 Statewide vehicle operating costs as a result of rough roads total $3.9 billion annually. A total of 35 percent of New Jersey’s bridges show significant deterioration or do not meet modern design standards. Nine percent of New Jersey’s bridges are structurally deficient, with significant deterioration to the bridge deck, supports or other major components. An additional 26 percent of the state’s bridges are functionally obsolete, which means they no longer meet modern design standards, often because of narrow lanes, inadequate clearances or poor alignment. Traffic congestion in New Jersey is worsening, costing the average motorist $1,501 annually in lost time and wasted fuel – a total of $6.2 billion each year. The average daily commute for New Jersey residents is 31 minutes, the third longest nationally, behind only New York and Maryland. The national average is 26 minutes. “The TRIP report underscores how important renewing the New Jersey Transportation Trust Fund program is to motorists in our state. In the long run, driving on well-maintained roads is far less expensive than paying for needless car repairs, congestion and crashes that result from an underfunded transportation system,” stated Philip Beachem, president of the New Jersey Alliance for Action. New Jersey’s overall traffic fatality rate of 0.74 fatalities per 100 million vehicle miles of travel is lower than the national average of 1.08. The state’s rural roads have a traffic fatality rate that is more than three times higher than the rate on all other roads in the state (2.10 fatalities per 100 million vehicle miles of travel versus 0.67). TRIP estimates that roadway features may be a contributing factor in approximately one-third of fatal traffic crashes. The efficiency and condition of New Jersey’s transportation system, particularly its highways, is critical to the health of the state’s economy. Annually, $816 billion in goods are shipped to and from sites in New Jersey, mostly by truck. Seventy-three percent of the goods shipped annually to and from sites in New Jersey are carried by trucks and another 18 percent are carried by courier services or multiple mode deliveries, which include trucking. $13.1 billion Driving on deficient roads costs New Jersey motorists a total of $13.1 billion annually in the form of additional vehicle operating costs (VOC), congestion-related delays and traffic crashes. $2,626 TRIP has calculated the cost to the average motorist in New Jersey in the form of additional VOC, congestion-related delays and traffic crashes. The average New Jersey driver loses $2,626 annually as a result of driving on roads that are deteriorated, congested and that lack some desirable safety features. 574 A total of 2,870 people were killed in New Jersey traffic crashes from 2010 to 2014. An average of 574 fatalities occurred annually on New Jersey’s roads in the last five years. 3X The fatality rate on New Jersey’s non-interstate rural roads is more than three times higher than all other roads in the state (2.10 fatalities per 100 million vehicle miles of travel vs. 0.67). 37% Statewide, 37 percent of New Jersey’s major roads are in poor condition. Forty-one percent are in mediocre or fair condition and the remaining 22 percent are in good condition. Annually, $816 billion in goods are shipped to and from sites in New Jersey, mostly by truck. 35% A total of 35 percent of New Jersey bridges show significant deterioration or do not meet current design standards. Nine percent of the state’s bridges are structurally deficient and 26 percent are functionally obsolete. $1,501 Per Driver The average New Jersey driver loses 64 hours each year stuck in congestion. Congestion related delays cost the state’s drivers a total of $6.2 billion annually, an average of $1,501 per driver. 3rd Longest The average daily commute to work for New Jersey residents is 31 minutes, the third longest nationally, behind only New York and Maryland. Eight years after the nation suffered a significant economic downturn, New Jersey’s economy continues to rebound. The rate of economic growth in New Jersey, which will be greatly impacted by the reliability and condition of the state’s transportation system, continues to have a significant impact on quality of life in the Garden State. With an economy based largely on manufacturing, chemical production, agriculture and tourism, the quality of New Jersey’s transportation system plays a vital role in the state’s economic growth and quality of life. In this report, TRIP looks at the top transportation numbers in New Jersey as the state addresses its need to modernize and maintain its system of roads, highways, bridges and transit. An inadequate transportation system costs New Jersey motorists a total of $13.1 billion every year in the form of additional vehicle operating costs (VOC), congestion-related delays and traffic crashes. Driving on rough roads costs all New Jersey motorists a total of $3.9 billion annually in extra vehicle operating costs. Costs include accelerated vehicle depreciation, additional repair costs, and increased fuel consumption and tire wear. Traffic crashes in which roadway design was likely a contributing factor cost New Jersey residents a total of $3 billion each year in the form of lost household and workplace productivity, insurance costs and other financial costs. Traffic congestion costs New Jersey residents a total of $6.2 billion each year in the form of lost time and wasted fuel. The rate of population and economic growth in New Jersey have resulted in increased demands on the state’s major roads and highways, leading to increased wear and tear on the transportation system. New Jersey’s population reached approximately nine million residents in 2015, a six percent increase since 2000. New Jersey had 6.2 million licensed drivers in 2014. Vehicle miles traveled (VMT) in New Jersey increased by 11 percent from 2000 to 2014 –from 67.4 billion VMT in 2000 to 74.9 billion VMT in 2014. By 2030, vehicle travel in New Jersey is projected to increase by another 10 percent. A lack of adequate state and local funding has resulted in 37 percent of major locally and state-maintained roads and highways in New Jersey having pavement surfaces in poor condition, providing a rough ride and costing motorists in the form of additional vehicle operating costs. The pavement data in this report, which is for all arterial and collector roads and highways, is provided by the Federal Highway Administration (FHWA), based on data submitted annually by the New Jersey Department of Transportation (NJDOT) on the condition of major state and locally maintained roads and highways in the state. Statewide, 37 percent of New Jersey’s major locally and state-maintained roads and highways are in poor condition, while 41 percent are in mediocre or fair condition. The remaining 22 percent are in good condition. Driving on rough roads costs New Jersey motorists a total of $3.9 billion annually in extra vehicle operating costs – approximately $632 per driver each year. Costs include accelerated vehicle depreciation, additional repair costs, and increased fuel consumption and tire wear. More than one-third of locally and state-maintained bridges in New Jersey show significant deterioration or do not meet current design standards often because of narrow lanes, inadequate clearances or poor alignment. This includes all bridges that are 20 feet or more in length. Nine percent of New Jersey’s bridges are structurally deficient. A bridge is structurally deficient if there is significant deterioration of the bridge deck, supports or other major components. Structurally deficient bridges are often posted for lower weight or closed to traffic, restricting or redirecting large vehicles, including commercial trucks and emergency services vehicles. Twenty-six percent of New Jersey’s bridges are functionally obsolete. Bridges that are functionally obsolete no longer meet current highway design standards, often because of narrow lanes, inadequate clearances or poor alignment. The chart below details bridge conditions statewide. Improving safety features on New Jersey’s roads and highways would likely result in a decrease in the state’s traffic fatalities and serious crashes. It is estimated that roadway features are likely a contributing factor in approximately one-third of all fatal and serious traffic crashes. A total of 2,870 people were killed in New Jersey traffic crashes from 2010 to 2014. New Jersey’s overall traffic fatality rate of 0.74 fatalities per 100 million vehicle miles of travel in 2014 was lower than the national average of 1.08. The fatality rate on New Jersey’s non-interstate rural roads in 2014 was more than three times higher than on all other roads in the state (2.10 fatalities per 100 million vehicle miles of travel vs. 0.67). Increasing levels of traffic congestion cause significant delays in New Jersey, particularly in its larger urban areas, choking commuting and commerce. Traffic congestion robs commuters of time and money and imposes increased costs on businesses, shippers and manufacturers, which are often passed along to the consumer. Based on Texas Transportation Institute (TTI) estimates, the value of lost time and wasted fuel in New Jersey is approximately $6.2 billion per year – $1,501 annually per driver. The average daily commute for New Jersey residents is 31 minutes, the third longest nationally, behind only New York and Maryland. The national average is 26 minutes. Investment in New Jersey’s roads, highways and bridges is funded by local, state and federal governments. The recently approved five-year federal surface transportation program includes modest funding increases and provides states with greater funding certainty, but falls far short of providing the level of funding needed to meet the nation’s highway and transit needs. The bill does not include a long-term and sustainable revenue source. The efficiency of New Jersey’s transportation system, particularly its highways, is critical to the health of the state’s economy. Businesses rely on an efficient and dependable transportation system to move products and services. A key component in business efficiency and success is the level and ease of access to customers, markets, materials and workers. Seventy-three percent of the goods shipped annually to and from sites in New Jersey are carried by trucks and another 18 percent are carried by courier services or multiple mode deliveries, which include trucking. Sources of information for this report include the New Jersey Department of Transportation (NJDOT), the Federal Highway Administration (FHWA), the American Association of State Highway and Transportation Officials (AASHTO), the Bureau of Transportation Statistics (BTS), the U.S. Census Bureau, the Texas Transportation Institute (TTI) and the National Highway Traffic Safety Administration (NHTSA). Published on May 14, 2016 in California Builder & Engineer and Daily Dirt. Closed Tags: asphalt, bridges, California Department of Transportation (Caltrans), concrete, construction, construction industry, contractors, economy, employment, Federal Highway Administration (FHWA), Highway Bill, highways, infrastructure, Interstate Highway System, jobs, pavement, roads, safety, the American Association of State Highway and Transportation Officials (AASHTO), the Federal Highway Administration (FHWA), the Metropolitan Transportation Commission (MTC), the Sacramento Area Council of Governments (SACOG), the San Diego Association of Governments (SANDAG), the Southern California Association of Governments (SCAG), the U.S. Bureau of Transportation Statistics (BTS), the U.S. Census Bureau, the U.S. Department of Transportation (USDOT), transportation, TRIP, unemployment. Forty-two of the 125 transportation improvements identified by TRIP as being the most needed in California have Trip Report Identifies 125 California Transportation Projects Needed To Support Economic Growth, received a red light because they are unfunded and 69 of the projects have earned a yellow light because they only have partial funding available, jeopardizing the region’s future quality of life due to an inadequate transportation system. These transportation projects would support the state’s future development by improving access, safety and conditions according to a new report released recently by TRIP, a Washington, DC based national transportation organization. TRIP rated each needed transportation improvement as either having a green light, a yellow light or a red light in terms of the availability of funding, with a green light indicating that adequate funding was available. The report finds that more than one-third of the 125 most needed transportation projects in California have earned a red light because funding is not currently available and, under current funding, is not anticipated to be available through 2020. More than half of needed transportation projects in the state have earned a yellow light because only a portion of needed funding is anticipated to be available by 2020 or the funding is uncertain. Only 14 of the state’s most needed transportation projects have a green light, to signify that full funding is likely to be available or is anticipated to be available by 2020. “The TRIP Report highlighting important unfunded transportation projects in the San Francisco Bay area underscores the vital need for legislative action on a transportation revenue package to support a growing population and a robust economy,” said Will Kempton, executive director of Transportation California. TRIP has identified needed projects in the Los Angeles, Sacramento, San Diego and San Francisco urban areas, as well as projects outside those urban areas. 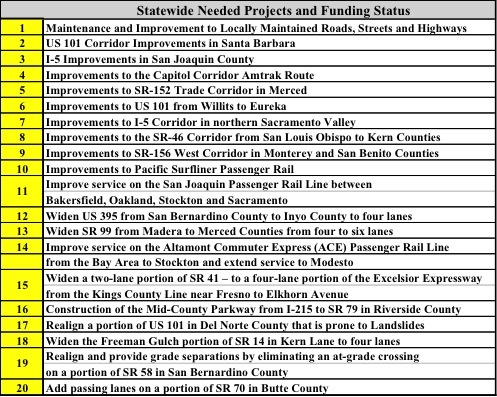 The transportation improvements outside the state’s largest urban areas, as determined by TRIP, which are the most needed to support quality of life and development goals, and their funding status are listed in the following table. Information on projects can be found in the report’s appendices: Appendix A – Los Angeles, Appendix B – San Diego, Appendix C – San Francisco, Appendix D – Sacramento and Appendix E – projects outside largest urban areas . The TRIP report also found that California continues to experience significant growth, with the state’s population increasing by 16 percent since 2000 to 39 million, Gross State Product increasing by 27 percent since 2000, when adjusted for inflation, and statewide vehicle miles of travel increasing by 5.3 percent from 2014 to 2015. More than half – 51 percent – of major urban roads in California have pavements in poor condition, eight percent of bridges in California are rated structurally deficient and the traffic fatality rate on California’s rural non-interstate roadways is nearly four-and-a-half times higher than on all other roads and highways in the state, the report found. Turning the red and yellow lights, which many of the region’s most critically needed transportation improvements currently face, to green lights, will require increased transportation investment at the local, state and federal levels. Signed into law in December 2015, the Fixing America’s Surface Transportation (FAST) Act, provides modest increases in federal highway and transit spending available to states, allows states greater long-term funding certainty and streamlines the federal project approval process. But the FAST Act does not provide adequate funding to meet the nation’s need for highway and transit improvements and does not include a long-term and sustainable funding source.